I know Questar is now QEP, but I hate to acknowledge the transition to yet another boring initial-based company name. Unfortunately, not much to say about Questar's third quarter conference call as it concerns the Haynesville Shale. With an increase in oil-based assets, especially after its big Bakken Shale acquisition in 2012, the Haynesville page in its operational update is now dead last. The company pulled its last rig in June and hasn't completed a well since April 2012. It has five wells drilled and cased but completion has been deferred to 2013. Haynesville production in Q3 was 261 MMcf/day (it was 42 MMcf/day in Cotton Valley/Hosston). The company expects Haynesville production to drop by 30% year-over-year in 2013. Not much else to say. "A little report from our operations, that thing hit Pennsylvania pretty hard. Our rig is still working this morning. All frac fleets are shut down. All of our flowback wells have been shut and all people are present and accounted for and on the job. So we made it through pretty well. But I would expect a lot of rigs and a lot of frac fleets for a while are going to be slowed down just because moving around -- a lot of water, a lot of wind and a lot of dangerous trees around. So I think it's going to slow down operations up there for a while." I've only seen a few other reports from producers, all of which downplay the damage from the storm. 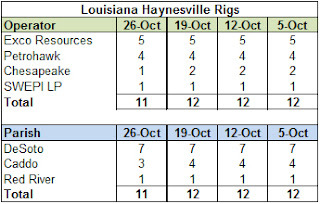 Haynesville production is around 1 Bcf/day of gross production. 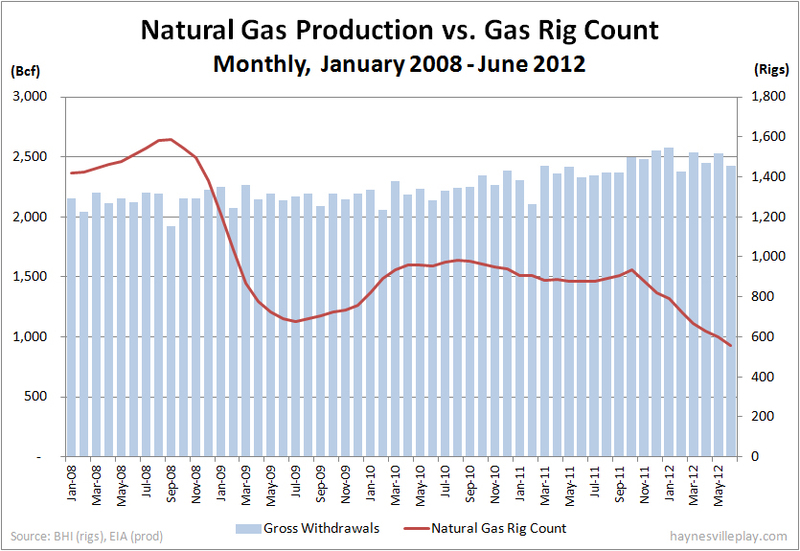 Production is declining since drilling has subsided, but management would not quantify this. EXCO has been choking back wells to avoid selling gas too cheap. Management seems to have found religion with the lower choke approach and expects it to be good for overall well performance and EUR (which might help enhance reserve figures). Over the past couple of years as companies are having fire sales of "non-core" assets that often times seem pretty choice, I've noted that there haven't been any big Haynesville sales. Sure, there have been JV deals, farm-outs, etc. but those are more for efficiency. There have been some corporate sales, like BHP buying Petrohawk or Exxon buying XTO, but that's more about cashing out. But it seems that many companies with serious positions in the Haynesville are reluctant to let that acreage go. Maybe I have a rosy outlook, but I think many companies recognize the uniqueness of the play and are waiting for gas prices to turn. And are you looking at a company that sells -- I mean, companies that might be a little bit levered, that shut-in a lot of production or have underdeveloped acreage that you can maybe just acquire and take a bigger bite? Well, we would. I'd say we're looking at a couple of companies. Right now, I'd say 5 or 6 of the deals we're looking at are private companies that just want to sell by year end for tax reasons. I'd say public companies that we've talked -- that would be a bigger challenge. Public company deals takes a long time. I would say we would focus -- we have looked at a couple. Investment bankers show them to us every day. They're probably not out loud for sale. But there are companies with assets in our neighborhood that we will for sure talk to, that have either quit drilling in the Haynesville or cut it way back." The emphasis is mine. I've heard chatter about some companies that are pulling back and might be in more of a contraction mode. At some point, a company with a significant Haynesville investment that has refocused on oil, is pessimistic about natural gas prices or is unable or unwilling to hold stagnant assets for the long term might be ready to move. With gas prices creeping up, this might be the time to sell, although it would still look (and be priced) more as a fire sale. I'll keep my ears open. Year-end should be very interesting. The Haynesville Shale rig count dropped by one rig this week to 19. The count was down one in Louisiana to 11 and held at eight in Texas. The Baker Hughes U.S. rig count was down 13 rigs this week to 1,826. Oil rigs were down two to 1,408, gas rigs were down 11 to 416 and miscellaneous rigs held at two. 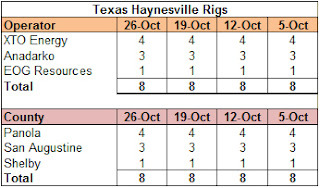 By type, horizontal rigs were down nine to 1,105, vertical rigs were down 13 to 512 and directional rigs were up nine to 209. 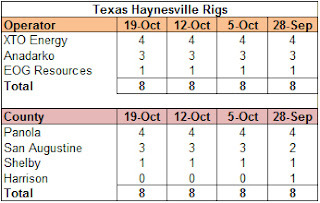 Among gas rigs, horizontal rigs were down 12 to 275, directional rigs were up two to 73 and vertical rigs were down one to 68. The Utica Shale has been touted as the Next Big Thing in oil and gas, drawing comparisons to the Eagle Ford Shale with the potential to generate dry gas, liquids and oil. Apparently there are major doubts about the viability of the play, at least on the oil side. Data is sketchy, as the oil and gas industry has defeated attempts to allow the state to publish production data more than once a year - in case you were worried that the industry was spending all of its lobbying and advertising budgets in Washington - but analysts have become skeptical that the play may offer more than gas on a commercial basis. Not that I have anything against gas, but I suspect there is little appetite from producers to go through the lease-and-drill routine if oil is not the target. Annual data will not be released until next spring, so analysts will have to depend on other publicly available clues, leaks and assumptions until then. Recent technological advances are making it commercially possible to stimulate coal-eating microbes to create natural gas. The microbes eat coal and excrete methane, the largest component of natural gas. A couple of companies have developed techniques to stimulate the microbes to produce more gas and introduce microbes to coal deposits where they don't currently reside. The practice is far from a done deal, but it looks promising for enhancing current coal bed methane wells and monetizing coal seams that are too expensive to drill. But in my mind, any opportunity to turn coal into something other than coal is a good thing. I love reading the occasional piece on George Mitchell, the commercial father of shale gas. There is a good piece in the Wall Street Journal today on Mr. Mitchell. Beginning in the early 1980s, he spent more than a decade perfecting the processes of hydraulic fracturing and horizontal drilling on a commercial basis, drilling many dud wells in the process. Once he perfected his techniques in the Barnett Shale, he was able to sell his company Mitchell Resources to Devon Energy for $3.1 billion. I refer to him as the "commercial father" of shale gas because it is easy to overlook the years of investment in research and development by the Department of Energy and other governmental agencies that helped create the shale boom. Major components of shale gas exploration and production, including sophisticated mapping techniques, hydraulic fracturing and horizontal drilling, had their start in government labs and government-funded programs. The government didn't make Mr. Mitchell a rich man, but it gave him the tools to create his own success. I bring this up not to downplay the role of Mr. Mitchell - his tenacity and willingness to risk his business brought shale gas to the market - but to reminded ourselves of the old cliche that no man is an island. Often the story of the self-made man overshadows the reality of the work of others. The EIA reported that gas in storage increased 67 Bcf last week, bringing the level of working gas in storage to 3.843 Tcf. The weekly injection was 29% below last year (+95 Bcf) and 3% above the five year average (+65 Bcf). 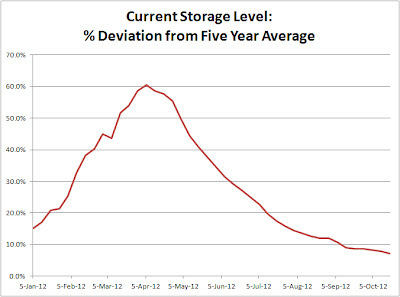 The current storage level is 4.1% above last year (3.69 Tcf) and 7.0% above the five year average (3.592 Tcf). Temperatures last week averaged 58.3 degrees, 1.3 degrees cooler than last year and 1.1 degrees warmer than average. As you probably already know, only Cheniere Energy (Sabine Pass Liquefaction, LLC) has received approval to export gas to countries with which the U.S. does not have a free trade agreement and that no other applications will be considered until the DOE completes a market impact study, due at the end of the year. The issue is surprisingly controversial with an odd combination of opponents, including environmentalists, industrial gas consumers and would-be free market advocates like the Koch Brothers. You know who is missing from the conversation? Coal miners. They should be all over supporting this like white on rice (or rather black on coal). Exporting LNG would help keep a floor under gas prices that should make it more expensive than coal for utilities to burn. They are fools to stay silent, fools I tell you! Interestingly, Oklahoma Sen. James Inhofe seems to be a big coal supporter. He currently is on a three state tour to boost candidates that support coal, or more specifically bash candidates that support clean air regulations that will reduce the use of coal and increase the use of natural gas. This is very curious behavior from a senator from Oklahoma, one of the biggest natural gas producing states in the country. It seems daft to devote time and money to try to eradicate anti-pollution measures that will serve to increase the use of natural gas and benefit his state. I guess it's just a case of putting party politics ahead of his state's interests. I wonder which group is putting up the money behind this trip. Dominion Resources announced today that it plans to close its 566 megawatt Kewaunee nuclear plant south of Green Bay, Wisconsin next year because of low natural gas prices caused by the abundance of shale gas. While nuclear power is cheaper to produce than burning natural gas, nuclear plants periodically require significant capital investment. Dominion is at the point with the Kewaunee plant where it must make that investment decision. But the price of electricity in the region is cheap and because of abundant shale gas likely will remain that way for the foreseeable future. Because Kewaunee is a smaller, standalone facility, the price of electricity didn't provide adequate payback and doesn't justify the investment. The article linked above notes a handful of other nuclear plants that might be vulnerable to low electricity prices. I don't much like talking about politics these days because it tends to end civil discourse, but lately I've been hearing more and more about which presidential candidate would be better for energy. In the debates so far, it's been a pretty weak-kneed conversation that has focused on gasoline prices rather than bigger picture issues. 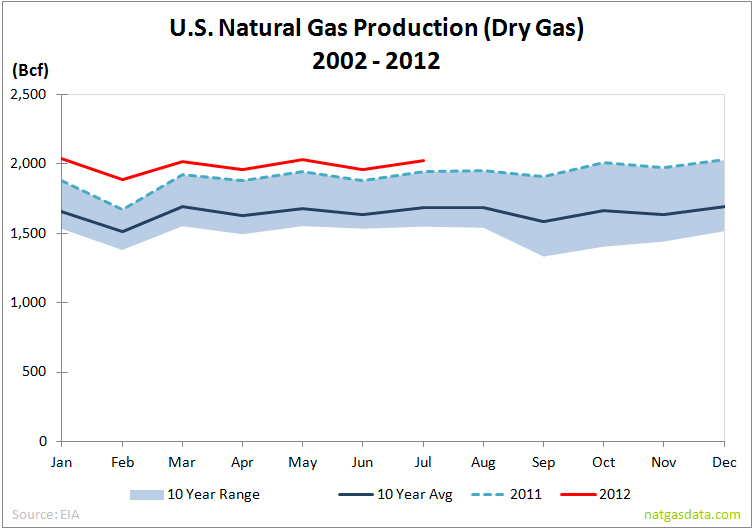 But I'd like to narrow the question to natural gas. There is one very big difference between the candidates when it comes to the future of natural gas, and that is their positions on burning coal. 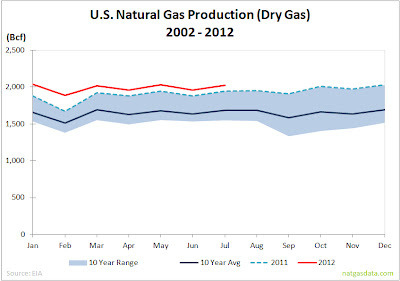 The single biggest opportunity to grow demand for natural gas is as a fuel for power generation. 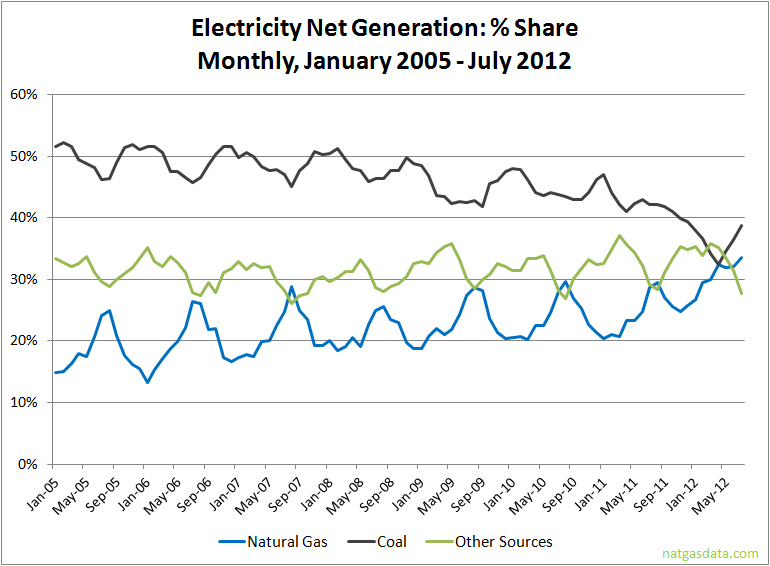 As we've seen over the past year, gas substitutes nicely for coal. On the horizon are numerous coal plant closures hastened by increased regulation of air pollution by the current EPA. This provides an avenue of growth for gas. There has been much howling on the subject, but it is a big positive for the natural gas industry (not to mention the environment, too). I'd expect the same approach from a second Obama term, with much of the same grousing. 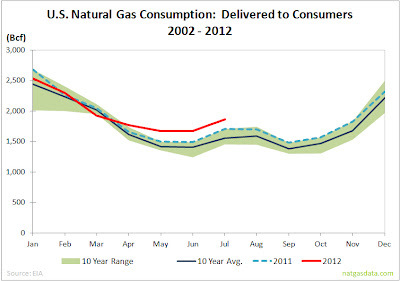 While few will admit it, he's actually been good for natural gas. But what happens if Romney is elected? He's bought into the whole "war on coal" PR campaign. I would suspect that his EPA will be considerably kinder to coal plants and likely would roll-back current regulations on coal power. 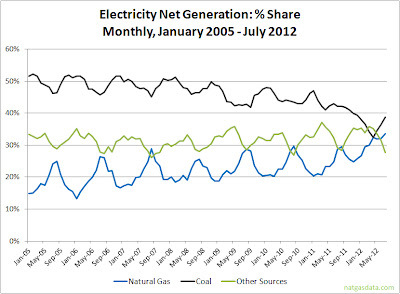 Coal has begun a slow descent as "America's Choice" for power generation, but without a push over the ledge, it will be a long slog before it gives up long-term market share, and natural gas will continue to be on the outside looking in. 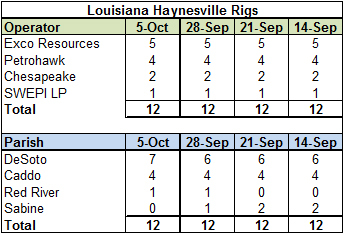 For the fifth consecutive week, the Haynesville Shale rig count was unchanged at 20, with both Louisiana (12) and Texas (8) remaining the same. Very little activity: four moves with none of the rigs even moving out of the same parish/county. Today's New York Times Sunday Business section featured a front page feature article on the Haynesville Shale. It looked back on the beginning of the play and shed some light on how the investment bankers for the producers raised the tens of billions of dollars from investors all over the world to fuel the massive leasing and subsequent drilling efforts that ultimately created a glut of natural gas that decimated the price of natural gas. The article has a particular focus on Chesapeake Energy and its main banker Ralph Eads, III of Jefferies & Company. It's a long article but well worth the time. I saw someone online characterize this article as "fracking bust coming." I disagree. It's certainly a cautionary tale on what happens when you have a market transformation come too quickly (and during the biggest recession of most of our lives). But the story behind the Haynesville Shale is not greed or hypocritical salesmanship but what happens when you set in motion a chain of events that you can't control. Sure, the money was big and plenty. Sure, the wells were fat and easy. A rational player would have stopped drilling as soon as gas prices dipped below a certain threshold. But the deals in place - the leases with land owners and the financial and operational deals that funded the drilling - required that the producers keep producing, even when it made no rational economic sense. Hey, can I coin the phrase "Haynesville Paradox?" What does it take? Is there a national/international review board? I'll look into it. Oh, and does that rig count graphic below look familiar??? The Baker Hughes rig count showed a four rig increase this week, bringing the total number of working rigs in the U.S. to 1,839. Oil rigs were down one to 1,410, gas rigs were up five to 427 and miscellaneous rigs held at two. By type, horizontal rigs were up two to 1,114, vertical rigs were down four to 525 and directional rigs were up six to 200. Among gas rigs, horizontal rigs were down three to 287, directional rigs were up three to 71 and vertical rigs were up five to 69. 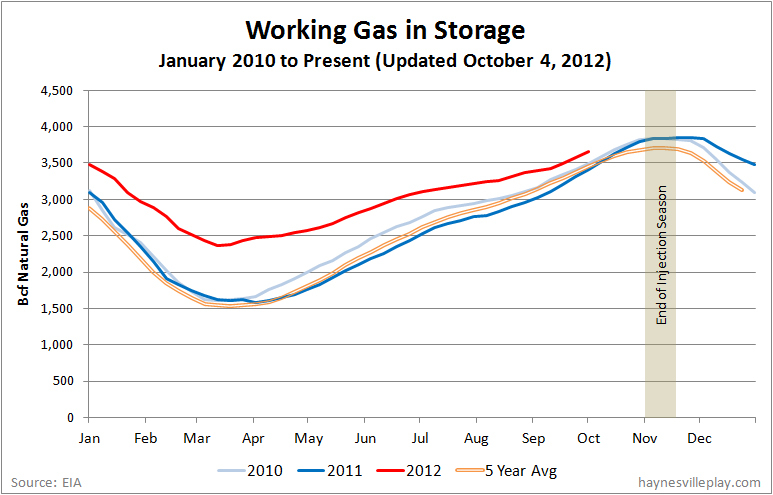 The EIA reported that working gas in storage was up 51 Bcf this week to 3.776 Tcf. The weekly injection was 52% lower than last year (+106 Bcf) and 28% lower than the five year average (+71 Bcf). 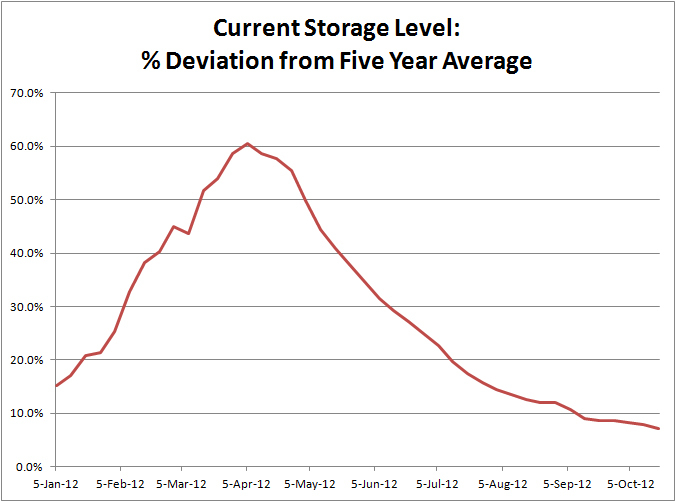 The current storage level now is 5.0% above last year (3.595 Tcf) and 7.1% above the five year average (3.527 Tcf). Not bad. Watching a presidential debate is painful to me, no matter if "my guy" is winning or losing. It's just frustrating to hear the candidates repeating talking points rather than directly answering questions. "Oil is commodity that is priced on a world market, and there is little to nothing that we as a country or I as the president can do about it. Period. If we want lower gas prices, we need to reverse the urbanization of China and India and achieve a peaceful Middle East. But both of those goals are unachievable, so we should all get used to higher gas prices if we want continued economic growth." Both candidates know this, but for some reason nobody has the guts to say they are powerless to change the situation. Instead we get a bunch of B.S. about the fiction of "energy independence" and the quantity of oil drilled on federal lands over the past several years. There was a little talk of conservation (which lowers consumption, not prices), but no mention of CNG, which is an actual alternative to gasoline. Booooooooring!! Booooooooring!! For the fourth straight week, the Haynesville Shale rig count was unchanged at 20 rigs, 12 in Louisiana and eight in Texas. This is the seventh straight week the Louisiana count held at 12. Can we call bottom now? The Baker Hughes U.S. rig count was down two rigs this week to 1,835. 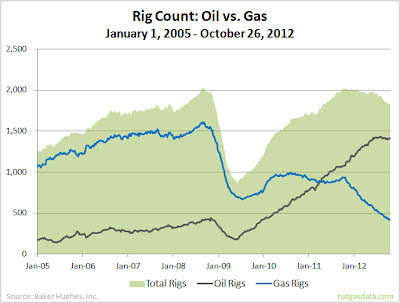 Oil rigs were up 13 to 1,411, gas rigs were down 15 to 422 and miscellaneous rigs held at two. By type, horizontal rigs were down 20 to 1,112, vertical rigs were up 18 to 529 and directional rigs were unchanged at 194. Among gas rigs, horizontal rigs were down 23 (!!!) to 290, directional rigs were down two to 68 and vertical rigs were up 10 to 64. In an interesting twist, Royal Dutch Shell applied for a permit from the U.S. Department of Commerce to export crude oil. Exporting U.S. crude is technically illegal without special permits. There are few specifics right now about how much oil would be exported, where it would be sourced and when it would commence, but it points out the importance of logistics to the oil market. I've always believed "energy independence" is a made-for-TV concept, and while we may ultimately be a net exporter of oil in coming decades we will continue to have to import the stuff because of logistical constraints, especially on the East Coast. No matter how much oil we drill, prices will be impacted more by demand in China and India than in the U.S.
What I wonder is if it will become a political football like LNG exports. I can't wait to see the reaction in Washington and in the media. As our quadrennial election season morphs from the silly season to the stupid season, I recently decided to turn off the television and seek out something nicer to talk about. 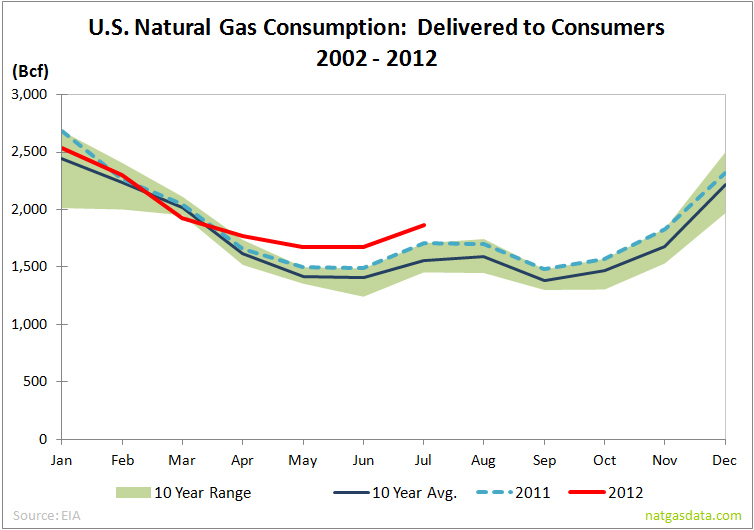 I hope to have found the subject in rising natural gas prices. Of course, no conversation these days is without debate, but at least the debate has changed from "how low will it go?" to "how high can it go?" As the chart below (with its nice autumnal shades) shows, prices have seen a nice rise over the past month an a half. 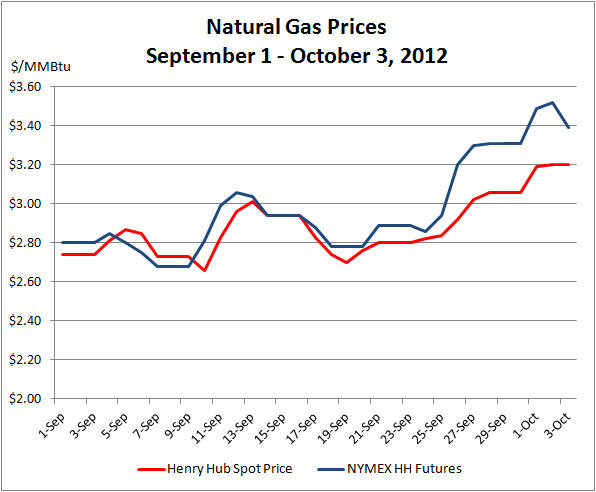 Since September 1, spot prices have gone up 54 cents/MMBtu (+20%) and the near month futures price has gone up 80 cents (+29%). What is also encouraging is that there finally is some spread between the spot and futures price, indicating some optimism in the market for higher prices. The bump generally occurred at the end of September when the futures contract switched from October to November, but the spread generally has maintained since then. Cue the debate about how high prices can go. There are those who see it going as high as $5/MMBtu, while others don't see it getting above $4. Weather has always been a big issue with gas prices as winter approaches and most weather predictions I've seen seem to indicate a normal winter. But even with a cold winter, the answer is more complicated than in past years. 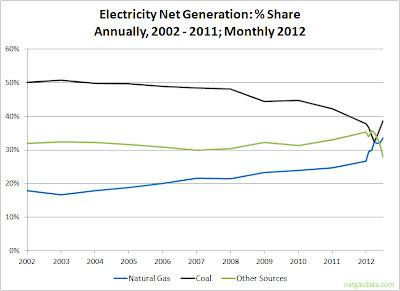 Coal/natural gas switching at utility plants is the big wildcard. Substituting gas for coal has saved gas prices for the past three years and especially in 2012. 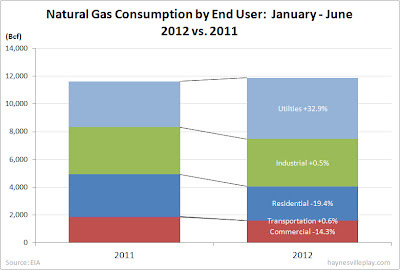 For the first six months of 2012, power generation represented the largest end user for natural gas at 37.1% of total consumption, up 32.9% from the same period in 2011, as shown below. 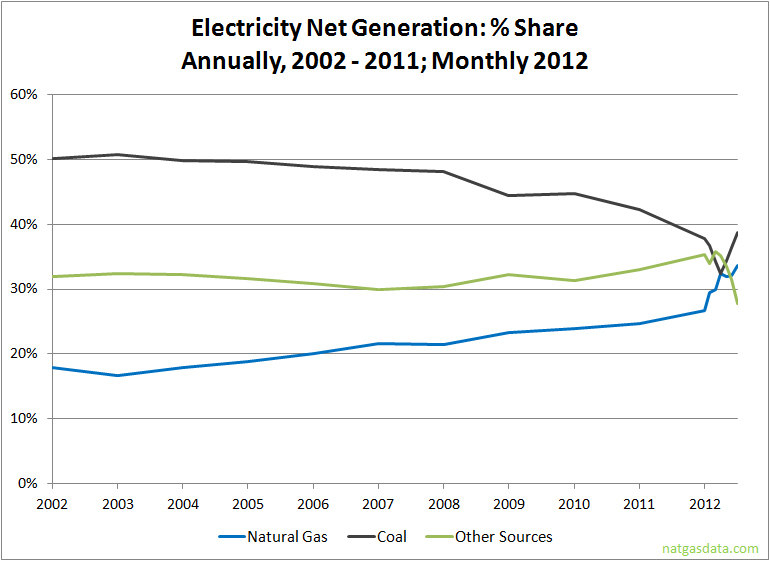 As gas prices trend upwards with cooler weather, some utilities will start to switch back to coal. But the question is by how much and what that magical switching price is? 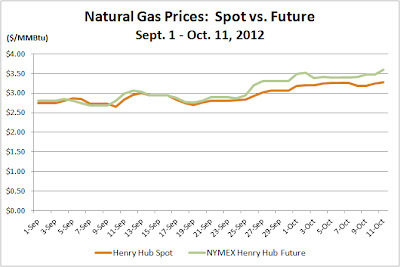 Also, will that switching price form a ceiling for gas prices or will demand from other users sustain prices? There is a price for each power plant where coal becomes cheaper to burn than gas. But how many utilities took advantage of low prices to buy gas forward? While - pick a number - $3.60/MMBtu might be the point where coal is cheaper than gas for a power plant, a utility might not make that switch if it has lined up a cheaper source of gas back in June. The other big issue is a cold winter. 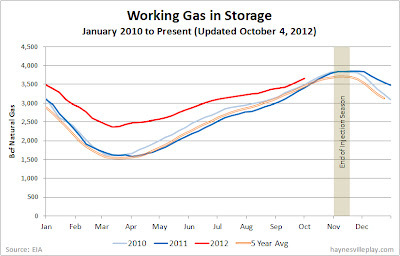 What happens if cold weather sharply lowers gas storage inventories? In the past, the answer is to drill more. Sounds good to me, but looking back at the past three and a half years, we saw a continual increase in production and a sharp drop in rigs, as shown below. That does not compute with historical industry logic. There are several reasons for the discrepancy, but two of the biggest are more associated gas from oil wells and less drilling to hold leases, and therefore more drilling of higher producing wells. 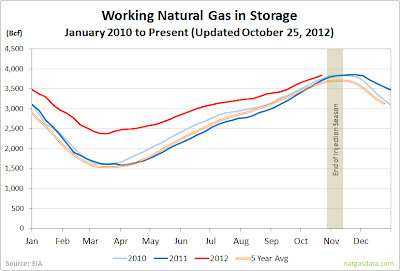 Associated gas is an increasingly large piece of supply that is produced irrespective of gas prices. As I noted last month, in 2011, 27.7% of gas produced (6.2 Tcf) came from oil wells, compared to 21.5% (5.78 Tcf) in 2010 and 19.8% (5.19 Tcf) in 2009. If prices start to climb, producers first are going to finish wells that have been drilled but remain uncompleted. 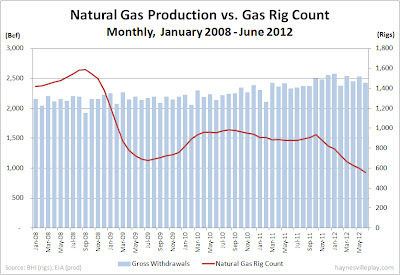 Once that inventory is reduced, drilling activity might increase in the next year. 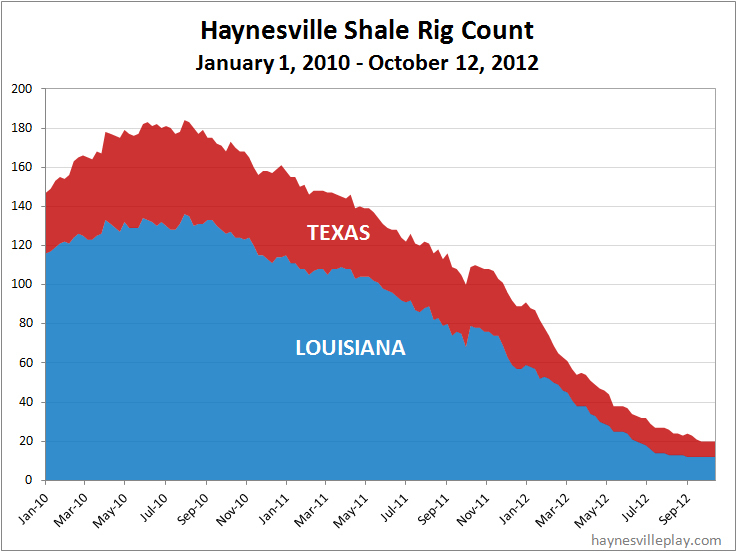 But I think it likely will start in areas other than Haynesville, which has been mothballed by many producers. We may see an uptick, but it probably will begin with producers that have kept some rigs in the area. Other producers might remain on the sideline until they can determine if prices will stabilize at an economic level. The bottom line is that gas prices will increase somewhat this winter, but it might not lead to greater activity in the Haynesville Shale. Still, it is a much more pleasant conversation than the elections. 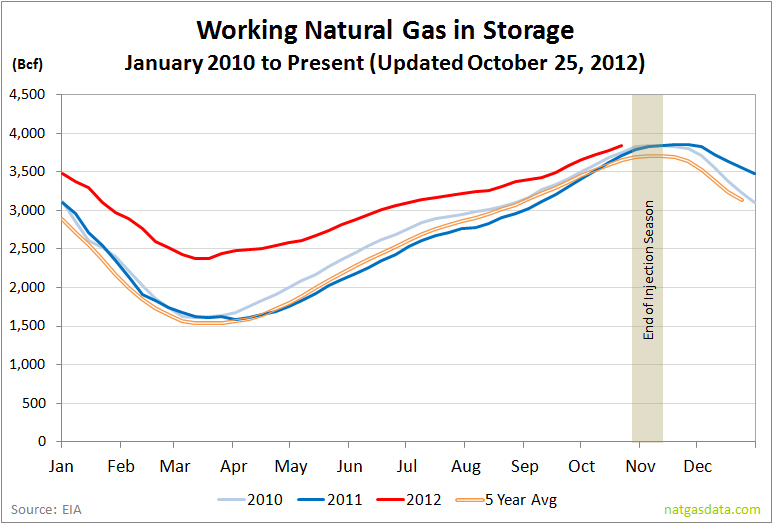 The EIA reported a 72 Bcf increase in gas in storage this week, bringing the total working gas in storage to 3.725 Tcf. The weekly injection was 33% below last year (+108 Bcf) and 14% below the five year average (+84 Bcf). The current storage level is now 6.8% above last year (3.489 Tcf) and 7.8% above the five year average (3.456 Tcf). 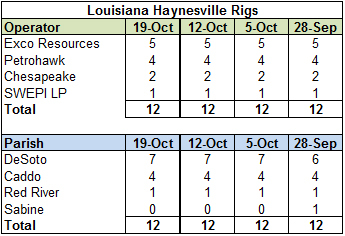 For the third straight week, the Haynesville Shale rig count held at 20, with both Louisiana (12) and Texas (8) remaining unchanged. This week marks the first time since I started compiling data in January 2010 that there hasn't been a working Haynesville rig in Sabine Parish, LA. The Baker Hughes U.S. rig count showed an 11 rig drop to 1,837. Oil rigs were down 12 to 1,398, gas rigs were up two to 437 and miscellaneous rigs were down one to two. 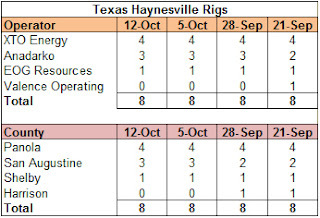 By type, horizontal rigs were down 10 to 1,132, vertical rigs were down three to 511 and directional rigs were up two to 194. Among gas rigs, horizontal rigs were up seven to 313, directional rigs were down five to 70 and vertical rigs held at 54. After years of competition and millions of dollars spent on economically unfeasible pipeline proposals, the principal producers of Alaskan natural gas seem to have come to an agreement to build an LNG export facility connected to a natural gas pipeline from the North Slope. This project would be built in lieu of the infamous gas pipeline from the North Slope, through Canada to U.S. markets, spurred by the Alaska Gasline Inducement Act from the Palin administration. While a good idea at the time, it quickly was rendered unfeasible by the advent of shale gas. While there are many specifics to work out - including pipeline route, location of LNG facility, permits and a true market feasibility test - the various warring parties have now agreed in principle to build $45 to $65 billion worth of export infrastructure in a project that could take ten years to deliver. Previously, Exxon and TransCanada won the rights for the AGIA pipeline, while BP and ConocoPhillips pushed another pipeline alternative. While a better alternative than the Canadian pipeline, it is no done deal. There are many headwinds, including potential regulatory push-back and the possibility that the market will not support the project. As developers of the proposed Kitimat export facility in BC have found out, the deals struck by Cheniere Energy for its proposed export facility in south Louisiana have poisoned the price waters by tying the price of its gas to Henry Hub, which has created an expectation among buyers that other gas sources in North America will be relatively cheap. But this is a vital project for Alaska given the fact that its vast resource of natural gas is otherwise stranded. Labels: Alaskan AGIA Pipeline, BP, ConocoPhillips, Exxon Mobil, Pipeline, TransCanada Corp. I was playing around with some numbers this morning and pulled together the chart below. As you can see, the red line is the current year and the blue shaded area is the range of prices from 2007 to 2011. 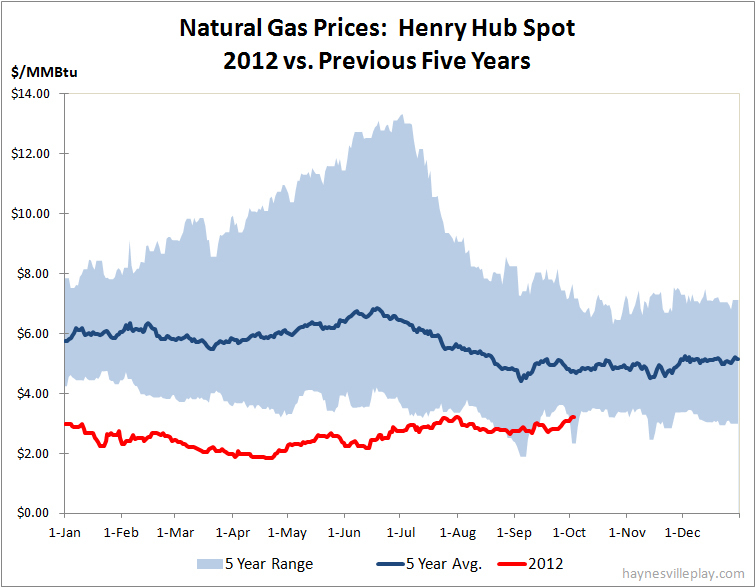 It gives you some context to see just how low this year's natural gas prices have been. 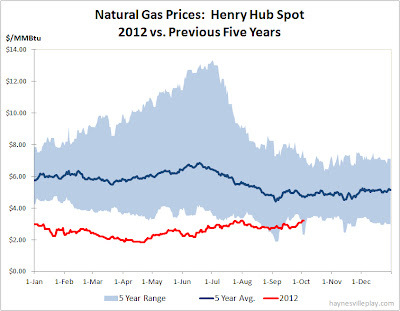 While prices are easing back into the shaded area, keep in mind that the low end of the range is from 2009 when we thought the sky was falling, at least in terms of natural gas prices. In other words, hardly an auspicious achievement. The EIA reported a 77 Bcf net natural gas storage injection, bringing the total working gas in storage to 3.653 Tcf. The weekly injection was 24% below last year (+101 Bcf) and in line with the five year average (+78 Bcf). 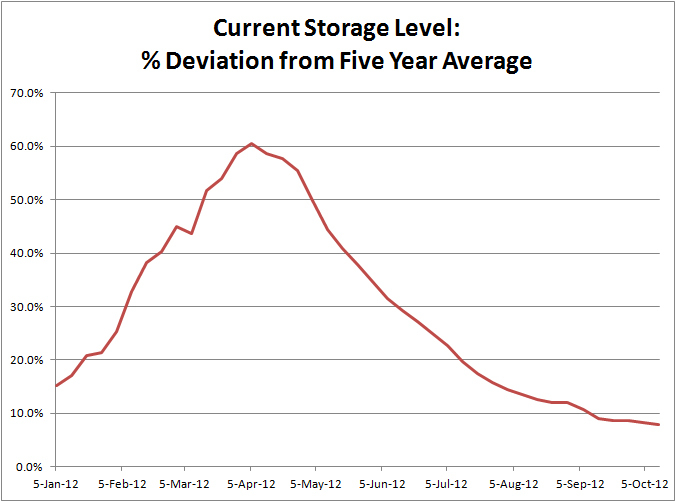 The current storage level now is 8.0% above last year (3.381 Tcf) and 8.3% above the five year average (3.372 Tcf). Nothing like a dose of low prices to kill a seller's market. Case-in-point is the proposed Kitimat LNG export facility in British Columbia. Developers of the project are miffed that the LNG export deals signed by Cheniere Energy earlier this year that are tied to Henry Hub pricing are setting the expectation with buyers for inexpensive North American LNG. The Kitimat project is being developed by Apache, Encana and EOG Resources as a way to bring the bountiful natural gas resources of B.C. to the Asian marketplace since the U.S. marketplace is saturated with gas. The problem is that Kitimat and its associated pipeline infrastructure is a greenfield project that will be very expensive to build. Compare that to Cheniere's Sabine Pass facility that is already built (at least for imports) and has ample neighboring pipeline capacity. Also, as pointed out by the Wall Street Journal, Cheniere is less sensitive to prices given its role as a middleman, while Apache, Encana and EOG are producers, for whom the price is very important. One advantage of Kitimat is its west coast location, but that is only a minor cost advantage over Gulf Coast facilities. The clock is ticking on Kitimat. It sounds like Asian buyers are sitting on the sidelines waiting for lower prices. Right now the U.S. government is sitting on future LNG approvals pending the release of a study around year-end. If the U.S. approves the pending applications, a proverbial flood of LNG will come to market with Henry Hub-based pricing. At that point Kitimat's owners will be in a tough spot. Kitimat is vital to B.C., but the economics might not work. 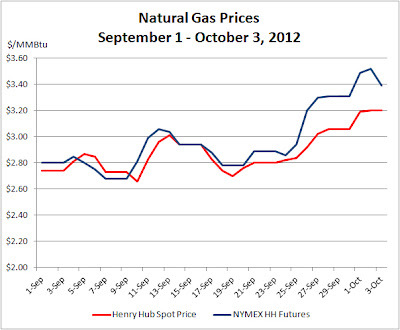 In case you missed it, natural gas prices have been rising over the past couple of weeks. 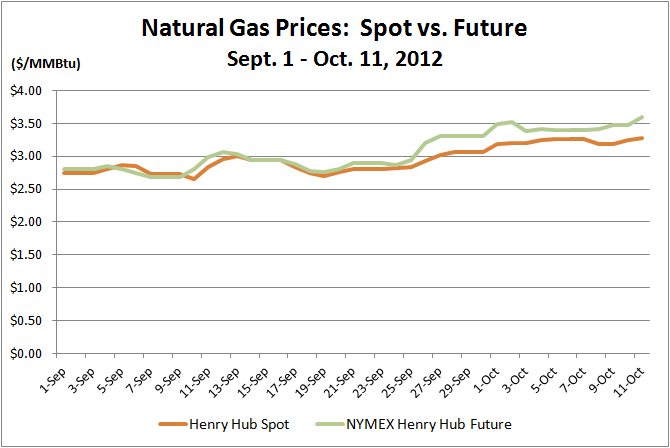 Versus two weeks ago, the Henry Hub spot price is up 18.5%, while the NYMEX HH futures price is up 21.9%. There is no guarantee this will stick, but it's nice to see a little lift in gas prices. The motivation seems to be the expectation of the arrival of cooler air in the next week to ten days with the underlying thought that this might lead to an early start to the storage withdrawal season. Who knows, but forecasts I've seen generally point to a normal weather this year. 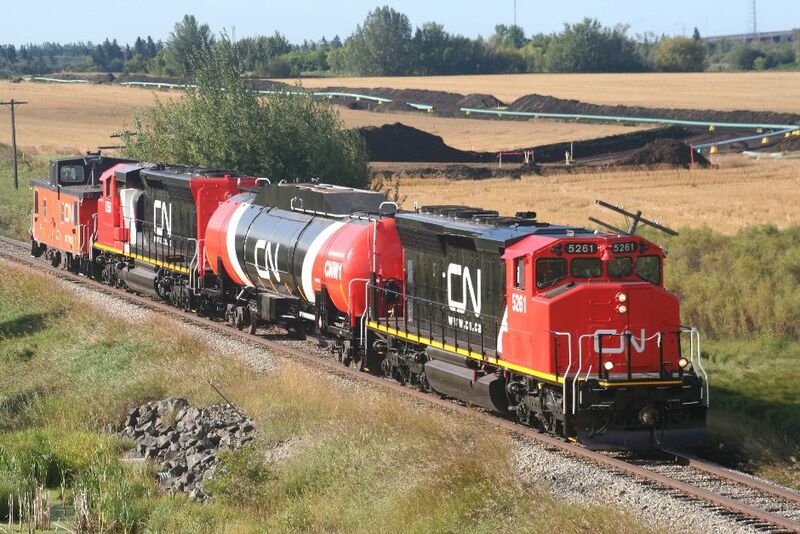 Canadian National Railroad has retrofitted two existing diesel locomotives to run on natural gas as the first step of a larger feasibility test for converting locomotives to gas (news release). Technically hybrids, the engines will run on 90% natural gas and 10% diesel fuel (for ignition). Ironically, the two locos will run the 300 mile oil sands route between production in Ft. McMurray and a pipeline hub in Edmonton. Encana will provide the fueling and maintenance in Edmonton. As the photo below shows, the liquefied gas is contained in a separate tank car. The second phase of the test project is to develop an engine and gas tender car specifically for natural gas (as opposed to retrofitting a diesel), which will be undertaken by Electro-Motive Diesel (a Caterpillar Co. subsidiary), Westport Innovations, Inc. and Gaz Metro of Quebec. A roadworthy prototype should be ready by 2014. To help fund the project, the Canadian government's Sustainable Development Technology Canada program provided Westport with C$2.3 million of funding. 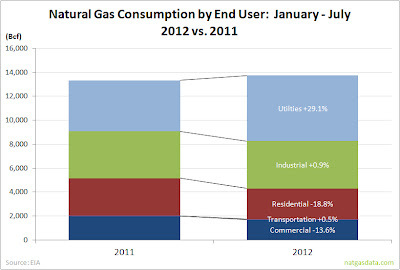 The push for natural gas is, well, a natural for railroads. They run fixed, predictable routes, spew lots of air pollution and have a firm view of the bottom line. CN estimates that the new hybrid engine "would reduce carbon dioxide emissions by 30 per cent and nitrogen oxide emissions by 70 per cent over a locomotive duty cycle." While the company didn't mention it in its press release, I'd wager that using natural gas over diesel will also save the company money. This project is certainly no done deal, but it will be interesting to follow. The Haynesville Shale rig count was unchanged this week at 20, with both Louisiana (12) and Texas (8) holding firm.